Teaching how all life is interrelated is a whole lot easier if you can show something akin to a family tree for living organisms. The Paleobiology Database has all the fossils organized by taxonomic relationships to help you find things in the database, but it is not very useful for visualizations. The Encyclopedia of Life has lot of information and multimedia available for over a million individual species and shows how they are classified and is quite useful if one is looking for information on a particular species. But again, it is not very visual. The Tree of Life website is an excellent website providing a great deal of information on phylogenetic relationships (for good discussion of phylogenetics, try here and here), providing abundant references on the primary literature discussing how scientists think various organisms are related. They work in collaboration with the Encyclopedia of Life, with the EOL focusing on species pages and TOL focusing on relationships. On TOL, one can start at the base of the tree and click on various branches following different groups into smaller and smaller groups, with each page providing what groups are descended from the starting group. For instance, the base of the tree starts with links to eubacteria, eukaryotes, and archaea, with viruses with a question mark. Each one is hyperlinked to a page discussing relationships within that group. 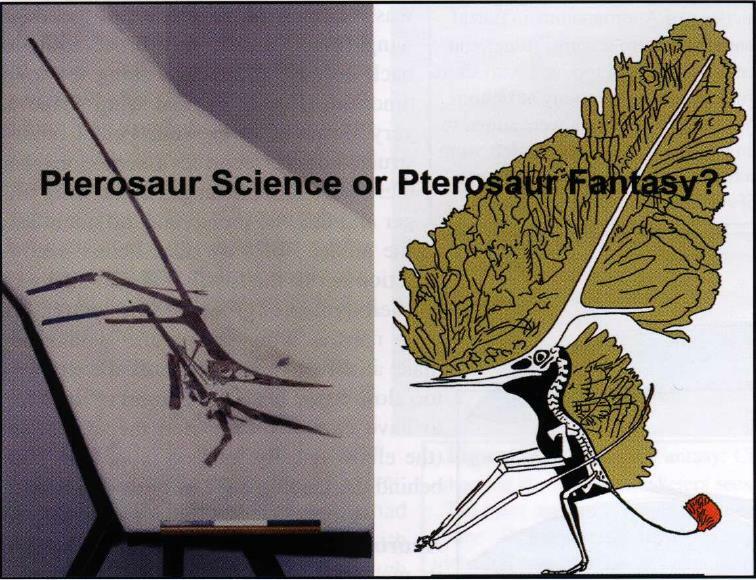 It also provides a discussion of possible alternative branchings as well. Thus, the relationships are not presented as “we know this to be true,” but as an active, ongoing process of discovery and research. It is often highly technical, but would be extremely useful for high school students working on an evolutionary or biodiversity topic. 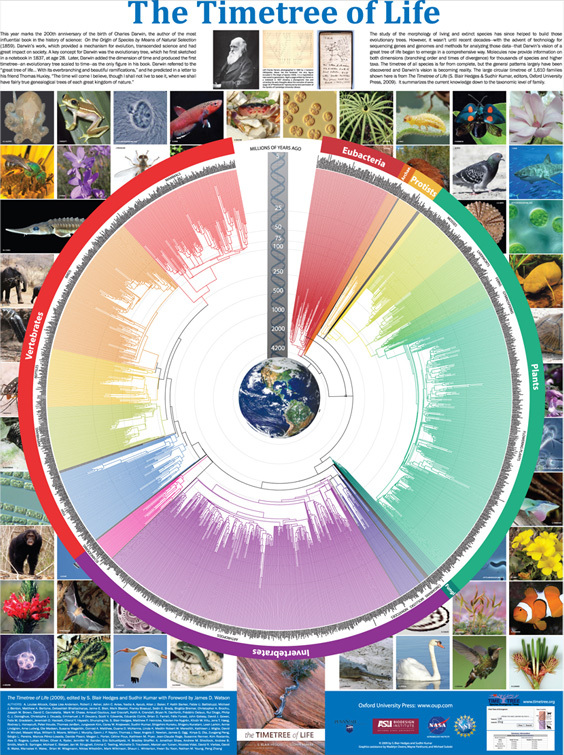 The Tree of Life and the Encyclopedia of Life are great sources for information on species and their phylogenetic relationships, but if you want better visualizations of the sum total of biodiversity, there are other websites that are definitely worth your time. The first I would like to mention is the Tree of Life interactive by the Wellcome Trust and BBC. Watch the great video with David Attenborough first, then dive into the tree itself. The tree simplifies life to about 100 representative species. It is seriously weighted toward mammals, so provides a very skewed version of biodiversity, but the presentation should appeal to those who are most interested in the overall development from bacteria to humans. 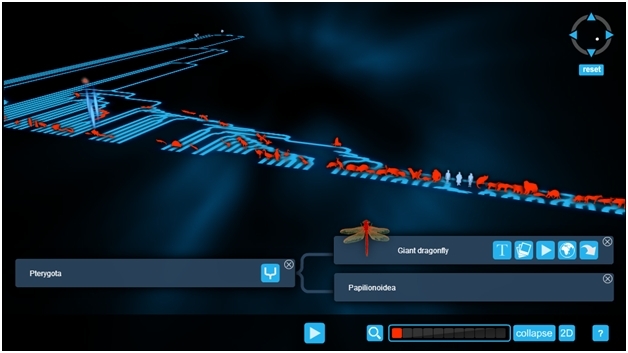 If once clicks on any individual species, it highlights the path to the base of the tree and provides a text description and in some cases pictures, a video, and locations. 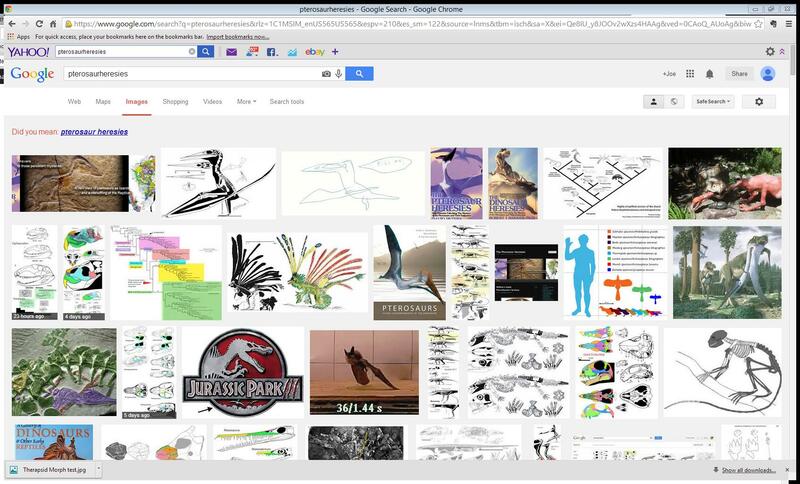 Click on another species and the path to the last common ancestor of the two selected species is highlighted. All the files are open source and available for free download, including the images and videos. Another interesting site is the Time Tree. 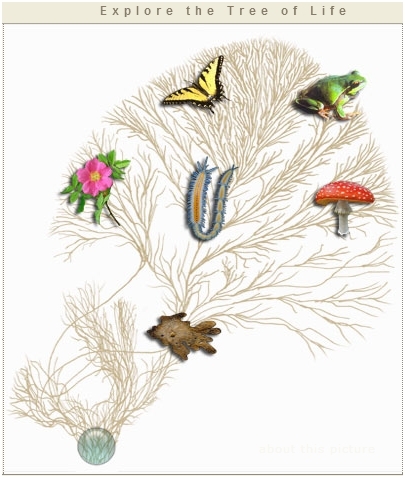 This site has a poster that shows 1610 families of organisms available for free download. The poster does a better job of showing the true diversity, but is still heavily weighted towards eukaryotes. 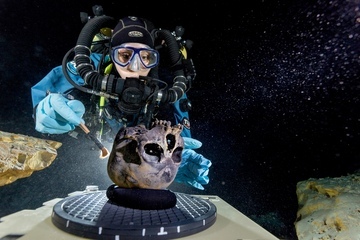 However, the real purpose of the site is to provide divergence dates between two species. Simply type in two species names using either scientific (say, Homo sapiens and Gallus gallus) or common name (say, human and chicken) and it will provide how long ago their last common ancestor lived. It should be noted here that the dates listed are estimates based on molecular data. They should not be considered as conclusive dates or anywhere near as precise as listed. Indeed, the value given is a mean value of several estimates, with the median value also given, as well as what they call an “expert result” (which they sadly do not explain). In addition, they provide the scientific references the results came from and the dates provided for each, which can be quite broad. In the example above, those values range from 196.5 to 328.4 million years ago, but of the nine studies listed, all but two fall within 317.9 and 328.4 million years ago. There is also a mobile version of the site, as well as an iPhone/iPad app, as well as a book. Another site of interest is Evogeneao.com. They have an interesting Great Tree of Life, as they call it, which like most others is heavily weighted toward eukaryotes. 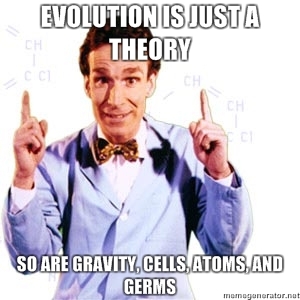 They have good explanations of evolution, along with a set of resources for teachers, including an interesting suggestion for how to introduce evolution to students. The interesting part of this site is their discussion of evolutionary genealogy, in which they extend the idea of a family tree farther back than it typically seen. They provide methods to calculate how far removed you are from other species. You can pick from a list of animals and it will tell you how closely you are related. 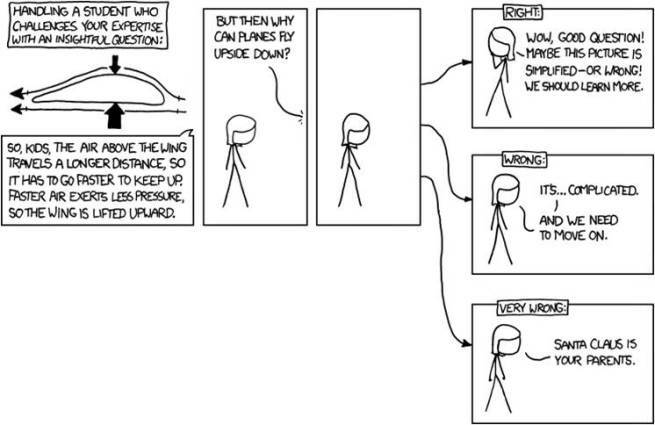 For instance, choosing dolphin returns an estimate of 27 millionth cousin, 9 million times removed. That nicely encapsulates not only the idea of relatedness, but the immense scales of time we are talking about. The Interactive Tree of Life, or iTOL, is another interesting site that may be of interest to high school teachers. 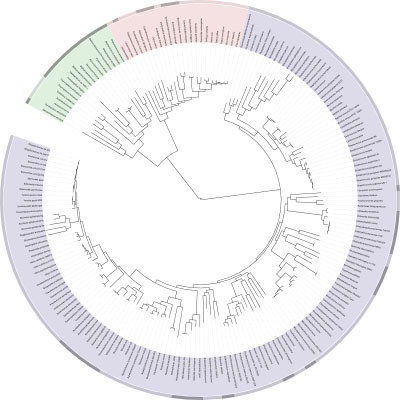 This site utilizes genomic data as the basis of its trees and, unlike the others, provides a better visual indicating how truly diverse prokaryotes are in relation to us. It also allows you to print out phylogenetic trees in different formats, depending on your preferences and what sort of information you want to display. You can even upload your own data if you wish, but most teachers will likely choose to stick with the displays already provided, as there are simpler programs to deal with trees that any but the most precocious senior high school student (or college student for that matter) may wish to create. There are a few other interactive trees out there that may be more appropriate to younger viewers. One is at the London Natural History Museum website. This one is very simplistic, having only sixteen branches, with four of them being primates, but it gets the point across. This interactive is limited to providing the link between any two branches and the name of the group containing both. For instance, clicking on the banana and the butterfly gives the name Eukaryota. 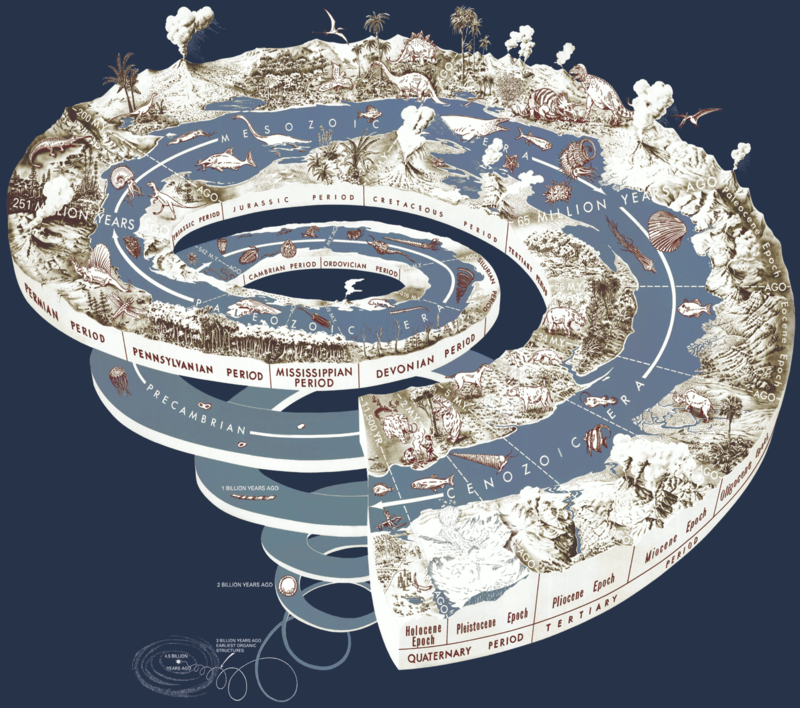 Another site provides an interactive for the poster Charles Darwin’s Tree of Life. 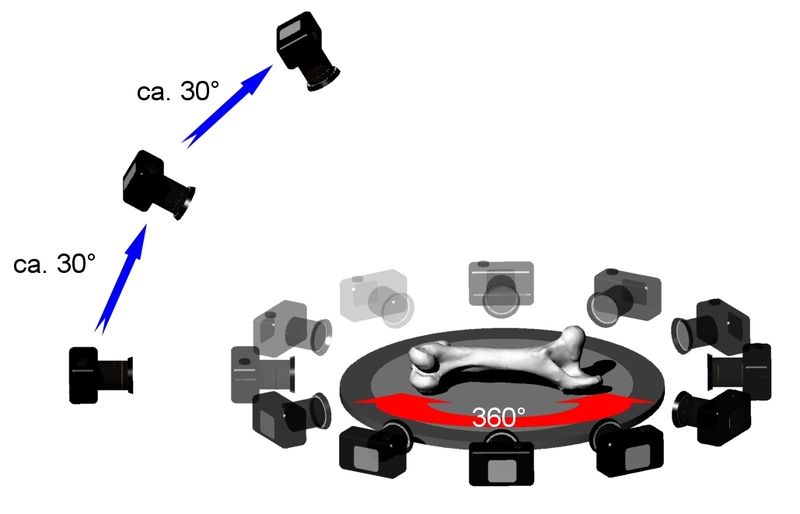 This interactive allows one to zoom in on any part of the tree and if one clicks on an animal, a short description of the animal is provided. Sadly, the two best interactives I have yet seen are not available on the internet. I had the opportunity to explore DeepTree at the Harvard Natural History Museum and it is truly spectacular, as is their FloTree. If you get a chance to see them, you should. Hopefully, one day they will be available in a broader format than now. All of this assumes of course, that people actually know how to read these trees, which is a false assumption in that most people really do not. So it would be useful to spend some time getting familiar with proper interpretation of them before using them in class. There are several resources explaining this (such as here and a really excellent video here), so I will not put a tutorial on here unless there are requests to do so. All images posted here are from the websites being discussed and are copyrighted to them. It may seem that the earth is pretty stable. You can always count on the mountains being there when you look for them. But the Earth is a dynamic place. Volcanoes, floods, landslides, and earthquakes all change the landscape in ways we can see quickly. What we don’t typically see is that if we expand these processes over long periods of time, those same processes alter the landscape far beyond our experiences. The surface of the Earth is covered in a crust broken up into numerous plates, which are constantly shifting and moving. The plates only move between 2.5 – 15 cm/year (the previous link contains information on how this is measured and provides activities for teachers for use in the classroom), but add this up over millions of years and the Earth looks quite different. Add into this mountain-building and erosion wearing down the mountains and you get radically different geographies for the planet. So what did the Earth look like in the past? There are two excellent sources providing maps of the planet through time. 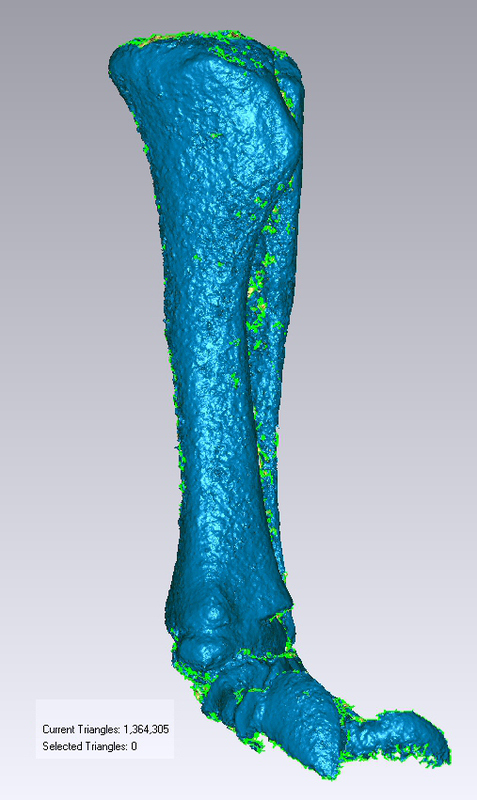 The first is the PALEOMAP Project, by Dr. Christopher Scotese. 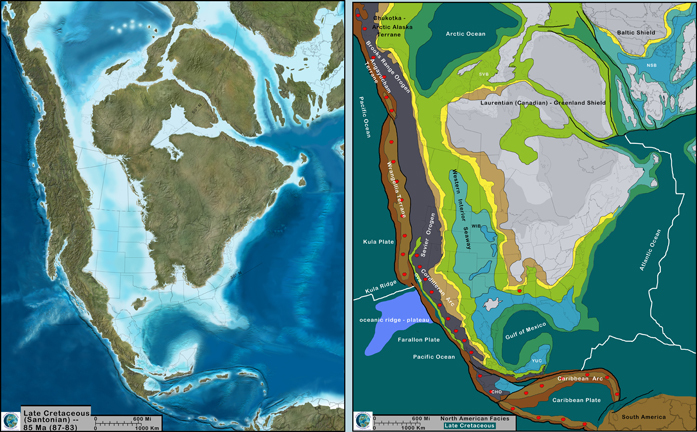 On this website, you will find maps ranging from 650 million years ago to the modern day and even into the future. There are 3D animated globes and interactive maps. He includes a methods section for how the maps wer put together and a list of references and publications. There is also a climate history section providing brief descriptions of the climate at various points in time. For teachers, there are several educational resources available, some of which are free, but others are available for a fee. There is even an app for the iPhone/iPad. It is not available yet for either android or Windows, but that has been admirably taken care of by the Howard Hughes Medical Institute with their Earthviewer app and they have done a wonderful job. 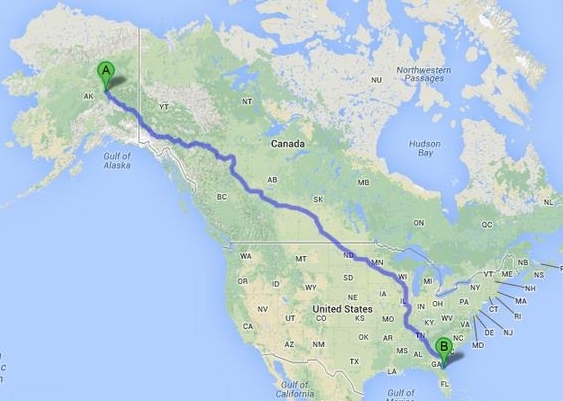 the app is fully interactive, allowing easy scrolling through time and full rotation of the globe. You can also track atmospheric oxygen and carbon dioxide, day length, important fossils, biological and geological events, and major meteor impacts. The app even provides a bibliography of their source material. In addition to the maps from Dr. Scotese, the app extends the timeline back to 4.5 billion years (although this extension is obviously not nearly as detailed as the Scotese maps due to the greatly extended time and the greatly decreased amount of available data). All in all, a great app, also reviewed by the NSTA. The second site that will be of interest is the Library of Paleogeography run by Dr. Ron Blakely. These maps cover approximately the same time frame as those provided by Dr. Scotese and are not animated. However, Dr. Blakely provides maps in different projections and provides regional coverage beyond that of global maps. So if you are specifically interested in paleogeographic maps of North America and Europe, this is an excellent resource. A third site also provides paleogeographic maps which are very useful. 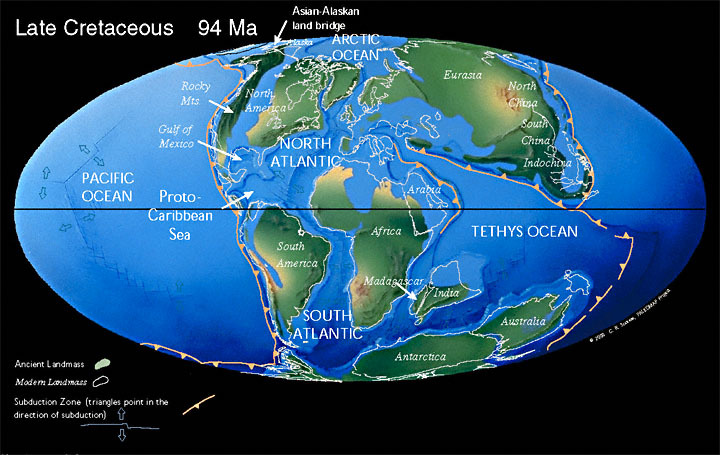 In this case, the maps are secondary to the main purpose of mapping fossil locations. 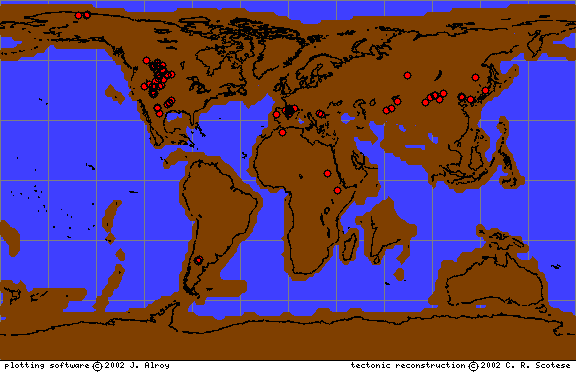 The Paleobiology Database contains records of fossil locations that have been published in the primary literature. One can perform a search by organism or group, country, rock unit or type, time interval, paleoenvironment, or publication. The results from the search are mapped onto global maps based on the PALEMAP Project. Dromeosaur fossils in 70 million year old rocks. All of these sources are available to the public and are used by professional researchers. Therefore, one can safely assume they represent accurate assessments of current, generally accepted thoughts on our Earth through time. You may notice that maps from Scotese and Blakely may not completely agree on all aspects. This is because it is very hard to piece together all the evidence and trace the movements of the continents backwards through time. Often, the data is incomplete and they have to make judgment calls based on the available evidence. Not everyone makes the same choices. This is true even for maps of current geography and is even more so for paleogeography. As we get more data and better techniques, those disagreements become fewer and fewer, but there is still much work to be done, so these maps can and will most likely be refined in the future to reflect new research.